Anthony Terrell Smith, better known by his stage name Tone Lōc (born March 3, 1966, Los Angeles, California), is an American rapper and actor. 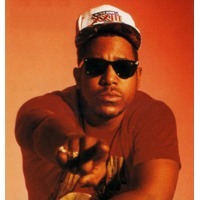 He is best known for his deep, gravelly voice and his million-selling hit singles, "Wild Thing" and "Funky Cold Medina". Tone Lōc is also a voice actor, having voiced characters in several cartoon series. He also voiced Fud Wrapper, the host of the animatronic show, Food Rocks, which played at Epcot from 1994 to 2004. In this latter role, he sang the song "Always Read the Wrapper", a parody of his own song "Funky Cold Medina". He provided vocals for FeFe Dobson for a track called "Rock It 'Til You Drop It" off of her first album, 2003's Fefe Dobson.